Coffee jelly is a popular Japanese dessert which is a coffee-flavored gelatin in a creamy coffee-flavored dairy base. My version is just as good, though somewhat different. Imagine our favorite dessert, the fruit salad : but instead of the canned fruit cocktail, I use the coffee gelatin. And naturally, the rich cream will be lightly coffee-flavored as well because of the gelatin. 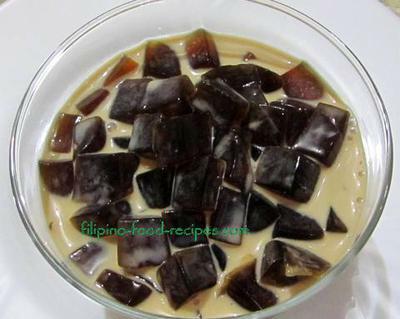 I'm thinking that while some people conclude their meals with a hot cup of coffee, why not try to finish off with a chilled coffee jelly dessert for a change? Try it! It's pretty simple to make! 1. 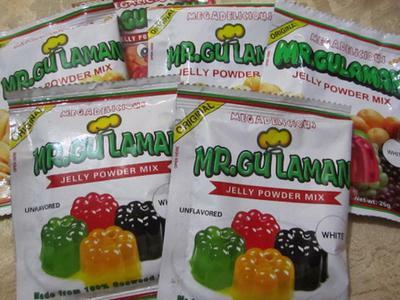 Dissolve the gelatin in 1 1/2 liters of water (or follow instructions on packaging). 2. Bring to a boil until fully dissolved, then add the sugar. Remove from heat. 3. Stir in the instant coffee and dissolve thoroughly. 4. Transfer in a shallow container to spread about 1 inch thick. Set aside. 6. In a a separate container, blend the all-purpose cream and condensed milk. 7. Add the gelatin and refrigerate.